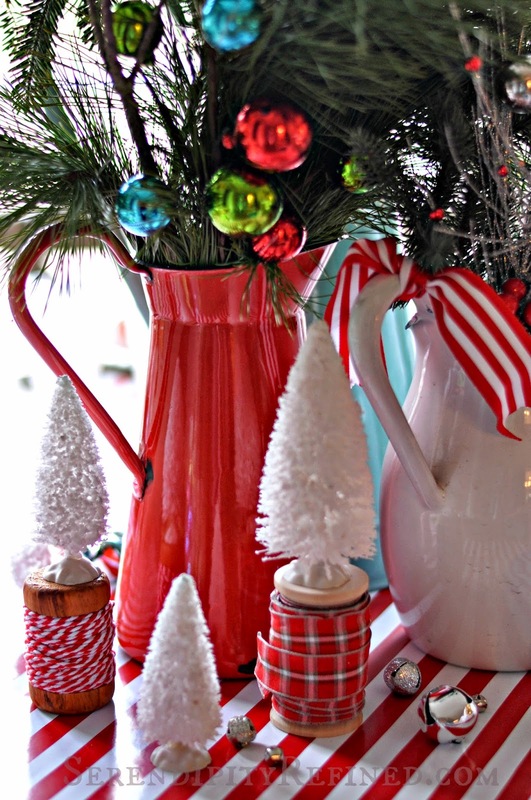 Welcome to Christmas in my farmhouse kitchen! My philosophy this year is inexpensive...and easy. 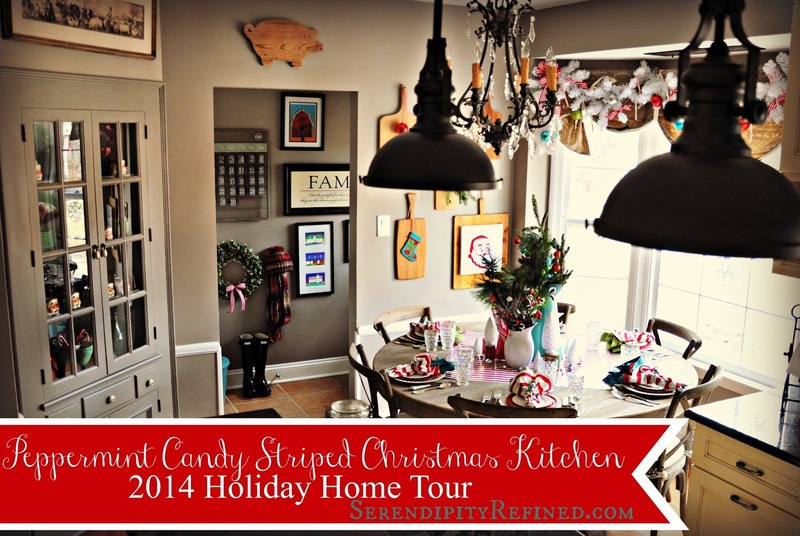 Ninety percent of this red and white striped candy cane kitchen was created using items that I already had on hand. My kitchen is tiny. So tiny in fact, that I had to stand in other rooms to take the "wide shots". (True story). Every year I vow that I'm going to do something different in the kitchen but for some reason, I always come back to red and green. 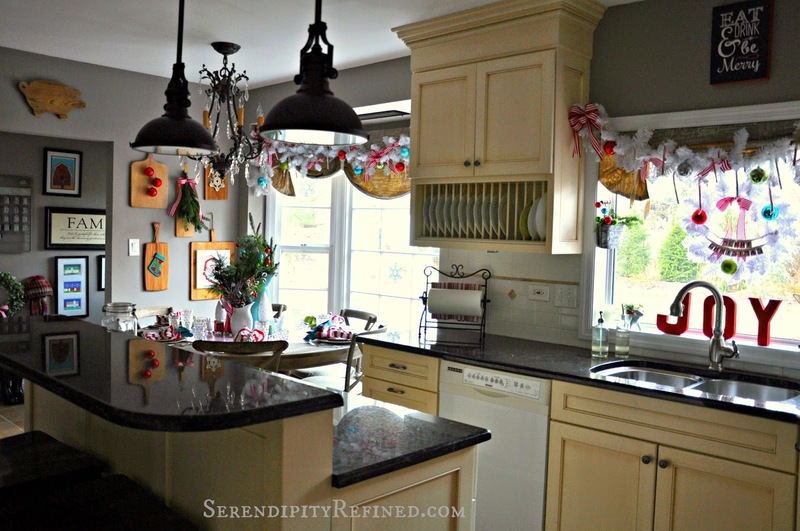 While other rooms in my home are decorated in pastels and whites, when it comes to the kitchen, traditional red is always my choice. 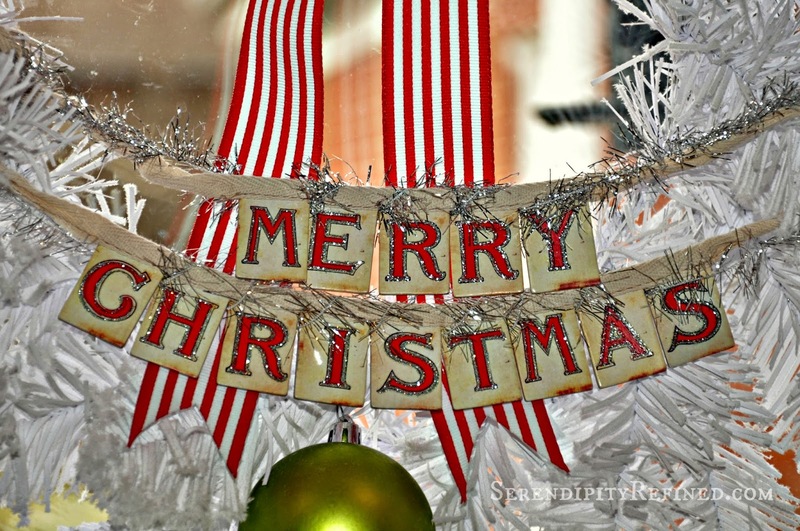 I grabbed a couple of lengths of white garland, a wreath, a small white tree and two spools of red and white striped ribbon at Michael's last week when they had their 60% off sale after Thanksgiving. To them, I added some plastic balls that I purchased at 80% off from Target last year after Christmas and a couple of boxes of candy canes. Never underestimate the power of a couple of spools of ribbon (or the ability of cute kitchen dish towels to masquerade as "wall art"!) 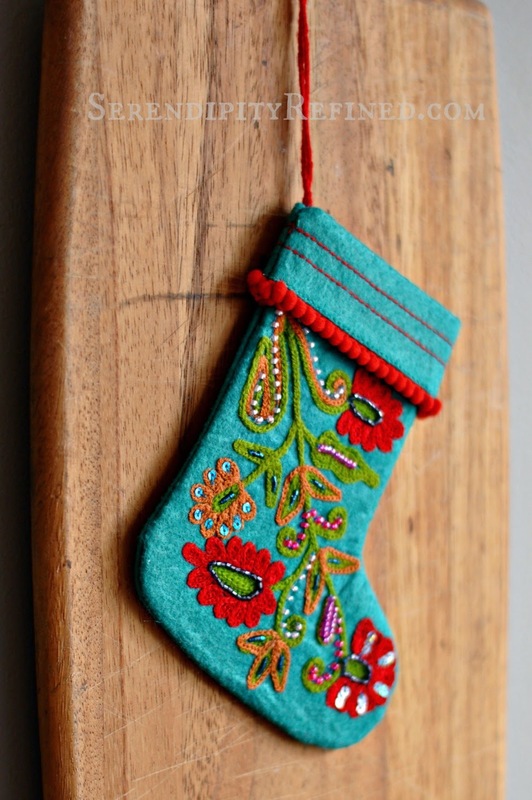 Towels and stocking ornament from World Market. 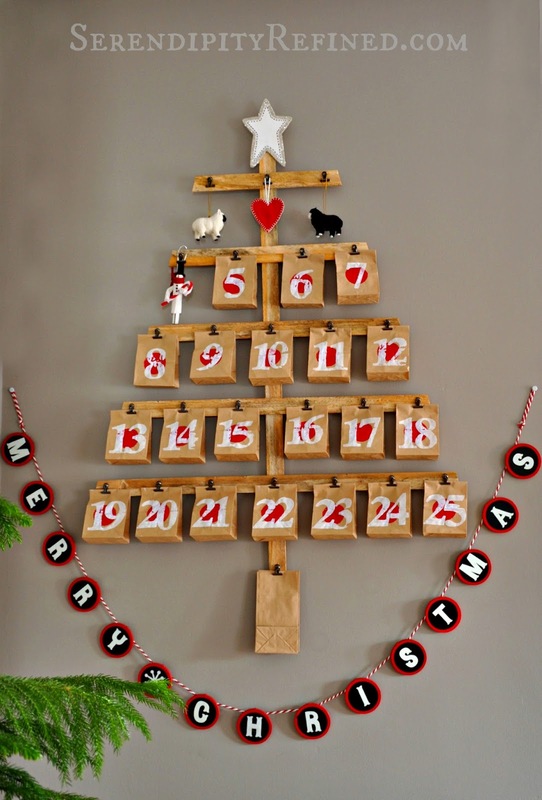 Every day items like cow creamers and pitchers look great filled with seasonal greens and holiday "picks" and Christmas ornaments can be hung from garlands or used to decorate things like breadboards. 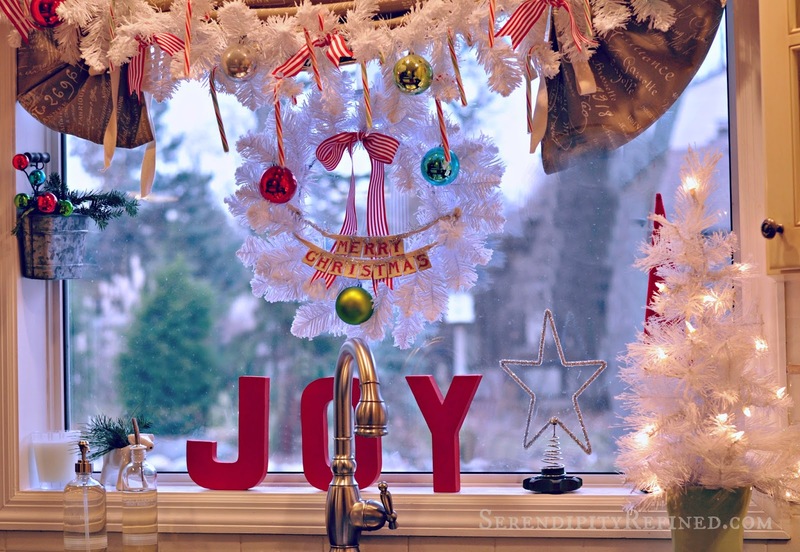 The "JOY" letters in the kitchen window were from Joann Fabrics $2.49 each (less 20% coupon). 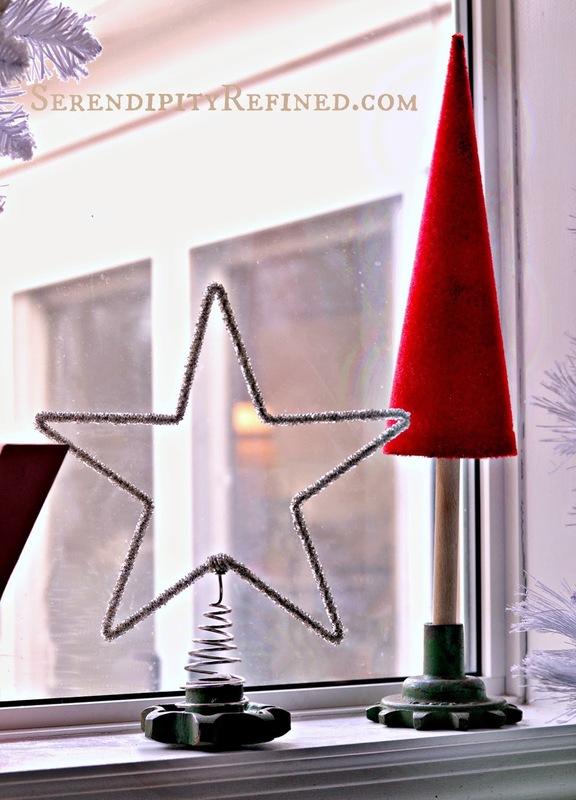 I placed a tree topper on an old metal gear and used a second one as to hold a "tree" made from a flocked red cone and a wooden spoon. 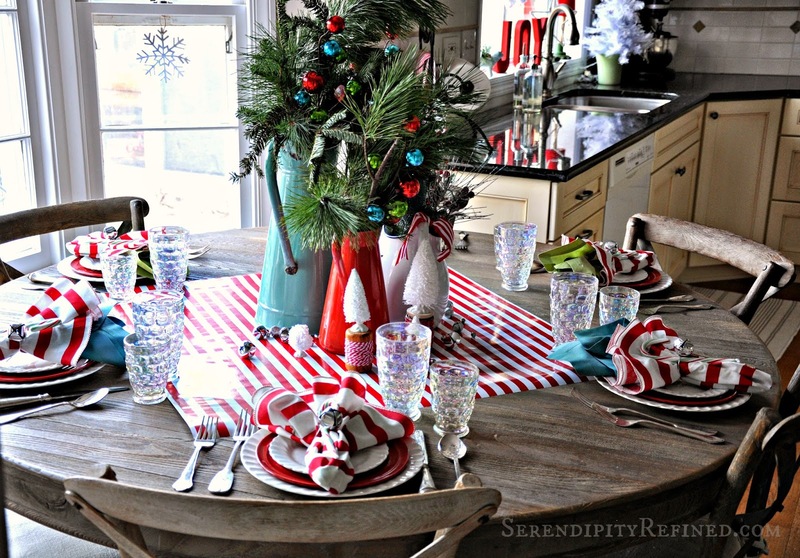 When it comes to setting the table, find a few red or green dishes to mix in with white ones. 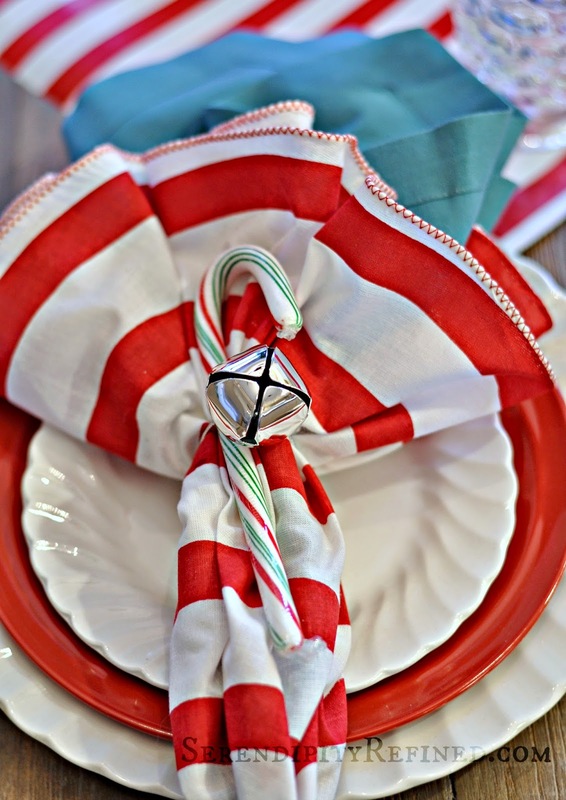 Tie a jingle bell around a napkin and sprinkle a few on the table. 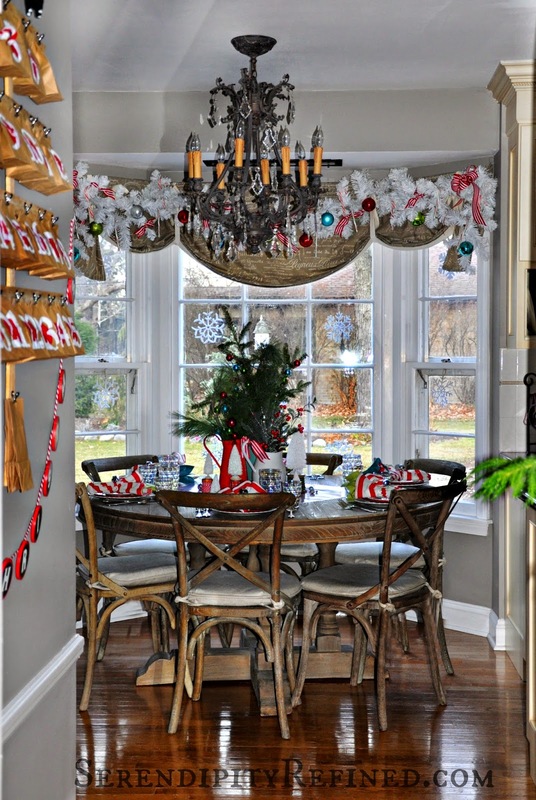 Bottle brush trees are readily available at most stores and empty wood spools wrapped with green and red ribbon or baker's twine make fine "tree stands". 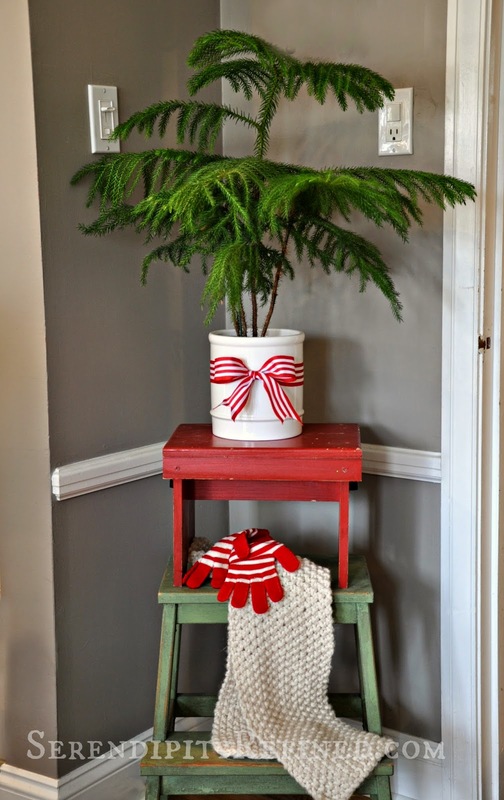 Pop a plant into an ironstone container, add a little ribbon, place it on top of red and green step stools (or an old ladder) add some mittens and voila! 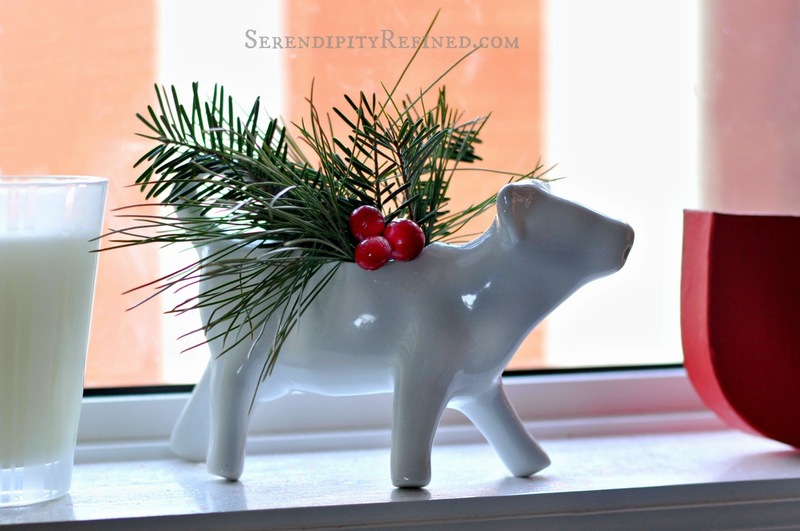 instant holiday decor...at no cost! Here's another secret: the table square in the center of the table is gift wrap! It makes fine table runners and place mats as well! 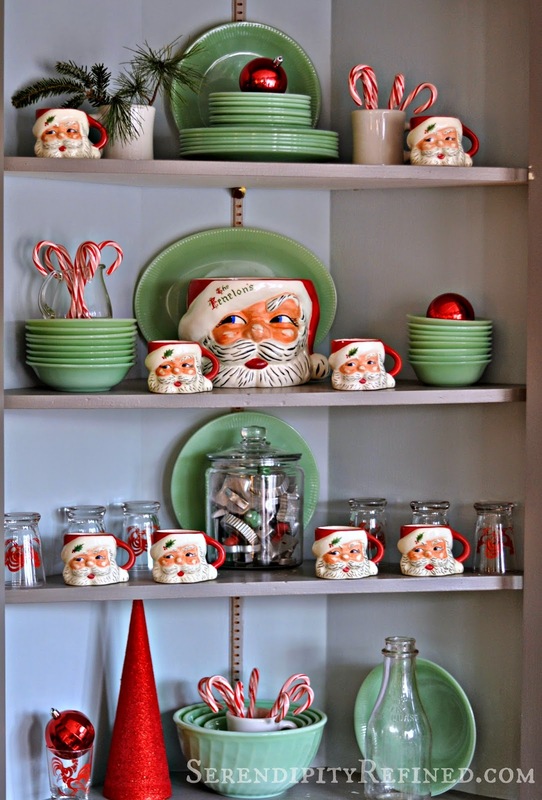 If you have a glass door cabinet, add a few seasonal items or find red and green dishes to display. I've found great dishes (like the white ones on the table above) at Goodwill for 99 cents each! The cabinet below is in the corner of my kitchen. 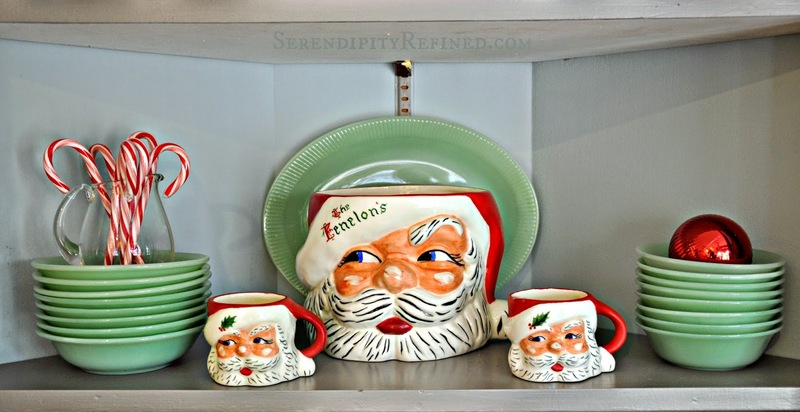 It holds some of my favorite things: my collection of Jadeite dishes, a few ironstone coffee mugs, a glass jar filled with vintage cookie cutters, some rooster juice glasses, and my Grandmother's "Tom & Jerry" set...also known as "Santa mugs". 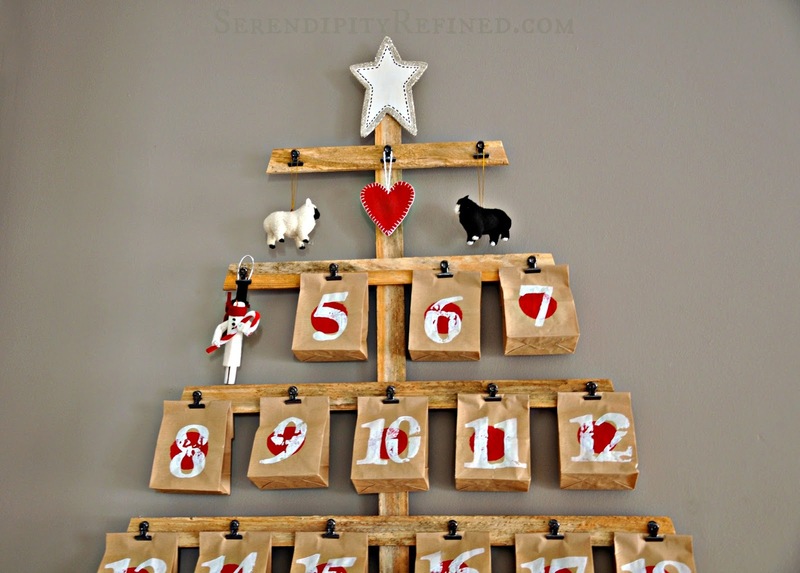 Finally, I made a Pottery Barn inspired advent calender out of reclaimed pallet wood and old lath (directions coming soon). This year, the ornaments that fill the brown paper sacks are in keeping with the colors that I used in the kitchen this year. 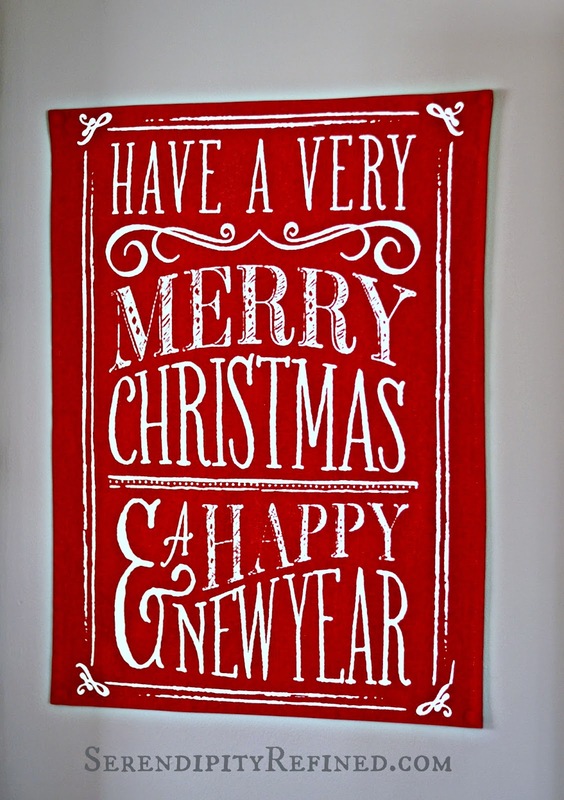 The "Merry Christmas" banner is from Target. Be sure to visit the other lovely ladies (all TWENTY FOUR OF THEM) who are opening their homes and sharing decorating tips this week. 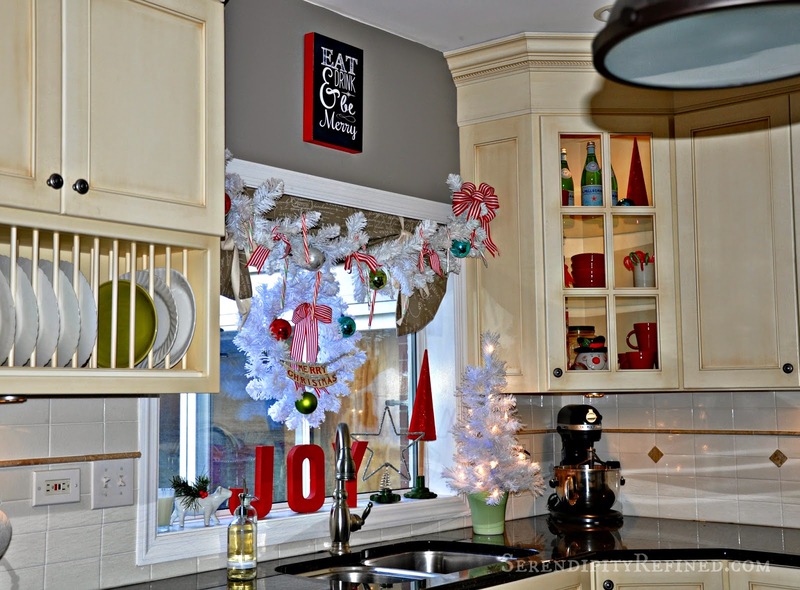 I think that the total that I spent to decorate my red and white candy cane kitchen for Christmas this year was about $30. The candy canes are destined to be tied on packages and crushed up for layered peppermint bark (recipe here) and everything else will be used again in coming years. 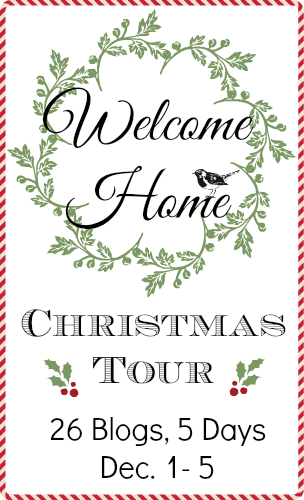 I'll be sharing more of my Christmas decorating in the next two weeks so I hope that you'll stop by again!